Thousands gather at Waterplace Park in downtown Providence to experience WaterFire. She patiently explains that WaterFire is actually a living sculpture created by local artist Barnaby Evans. During WaterFire, one hundred bonfires illuminate the three rivers that converge in downtown Providence, and gondolas ferry passengers up and down the fire-lit waterways. “Gondolas?” I say, “in Rhode Island? I still can’t picture what’s in store for us. Upon our arrival in Providence, I’m further baffled by our cab driver, who earnestly informs us that the fires are lit upon steel “brassieres” in the water. “Braziers,” Travis whispers, in answer to my confused expression. When we first arrive at Waterplace Park I can’t see the fires through the throng, only the orange glow they cast against the city skyline and their rings of smoke rising among the high-rises. 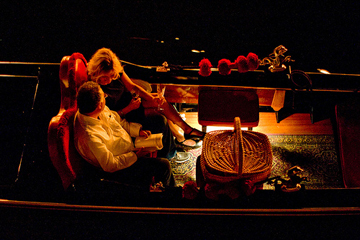 We’re greeted with aromatic cedar smoke and a dramatic crescendo of opera music. This is Evans’ intent, I learned from Travis, to stimulate all the senses at once. Still, I’m unprepared for the magnitude of the spectacle that awaits us once we finally sidle up to the railing. The lighting of the fires is a spectacle in and of itself. The braziers (three-foot-high baskets of steel-lattice, piled with blazing logs) are moored to buoys so the bonfires bob and float just above the waterline. This makes it seem as though the flames leap from the river itself, which looks like molten lava where the fires cast their reflections. Along the edge of the basin, thousands of people stand assembled, as if taking in a sporting event or religious ritual, their faces lit up by the fire below. The fires are kept continually stoked by volunteers who circulate in motorboats full of fresh-cut pine and cedar. Gondolas, piloted by volunteers who look every inch the part in their wide-brimmed straw hats and black and white striped shirts, glide beneath the series of arched bridges spanning the Providence River. “I usually think this kind of thing is cheesy,” says Travis, as a gondola skims near enough for a man in masquerade to reach out and hand red carnations to ladies at the railing. 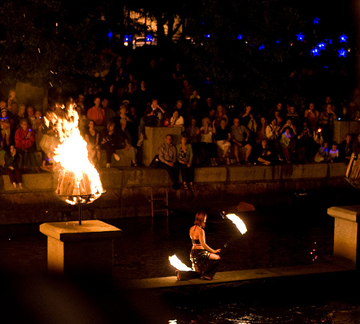 Evans envisioned WaterFire as a symbol of the revitalization of downtown Providence. On the night we attended, the fires raged so high and bright – ten and twenty feet tall in the center of the basin – that I couldn’t help but be reminded of burning oil fields in Iraq, or funeral pyres on the Ganges. 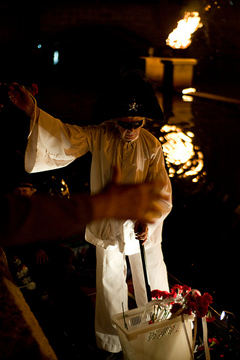 Evans created the first WaterFire installation in 1994, to commemorate the 10th anniversary of First Night Providence. 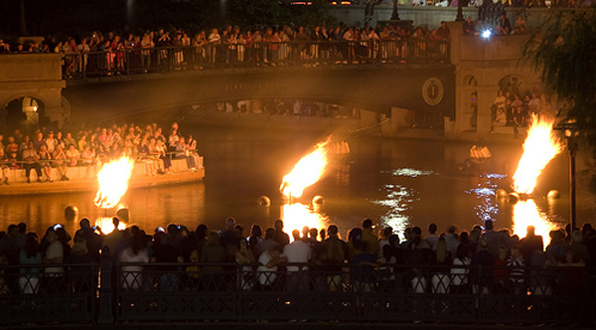 The original WaterFire proved so popular that Evans recreated it for the International Sculpture Conference in 1996. This sparked a grass roots effort to continue the project. Today, WaterFire is a nonprofit organization which relies on donations. It runs each year May through September. Visitors can support the project by stopping by one of the Ambassadors Stations or donating online. All who pony up in person are given special, luminous prizes. Check www.waterfire.org/ for the next dates. As of this publication, there are only four left this year.